EVE Online doesn't do anything haphazardly. So, after 13 years, the subscription-based massively multiplayer online sci-fi simulator is getting a major free-to-play component. The entire game isn't going free-to-play. But a decent chunk of it is. "We know that the mandatory monthly subscription is a big barrier for new players," says CCP Seagull, Executive Producer of EVE Online. "It's also one of our most common cancelation reasons when people leave EVE." Hence: Alpha Clones. And "Alpha Clone" is just EVE-speak for free-to-play player. The skills these free-to-play characters can pursue will be specific to the race you select. But all will have access to skills for flying low-level frigates, destroyers and cruisers. But trust me, that's a lot of ships, right there. Omega Clones are the second half of this "Clone States" equation. Omega Clones are exactly what you get today on a subscription account: full skill access at the regular rate of skillpoint accrual. If you're on a paid subscription when the Alpha Clones hit in November, then nothing changes for you. Everything procedes like Operation: Normal. If you're a paid subscriber and you let your subscription lapse, then your Omega clone reverts to an Alpha state. Which means that any skills you've trained beyond the Alpha state (which means ships, guns, shields, everything) go into a dormant state. You'll still have the skills, you just won't be able to access them—unless you re-up your sub. But you can keep playing. Just in this limited Alpha Clone state. More information is forthcoming on exactly which skills are available for Alpha Clones, and how high you can train those particular skills. You can even get your hands a little dirtier now by going to the dev blog. But again, you'll have access to the lowest tier of frigates, destroyers and cruisers. There is plenty of fun to be had with those ships. The Council of Stellar Managment—the real-life players elected in a player-voted election—have a couple weeks to gather feedback from their constituents (the EVE Online community) before flying out to Rekyjavic, Iceland, for a sit-down with developer CCP Games. The Council will take a fine-tooth comb to the entire proposition of introducing this free-to-play segement of the game, identifying potential, unintended exploits, and discussing its overall effect on the existing EVE community. Don't listen to the haters that keep trying to reduce EVE Online to "spreadsheets in space." Sure, the information is there if you want to dig that deep. There are charts and graphs to satisfy the latent accountant in all of us. And the toolbox is huge, if you want to grab that wrench and start torquing the nuts and bolts. But you can also have a heckuva time just skipping across the pond, if you will. I've done it many times over EVE Online's 13-year history. EVE Online is available on PC and Mac. Trial periods are still available, of course. And subscription rates run $10/month (if you buy one month at a time), or down to $8.33/month (if you subscribe to six-month or one-year packages). 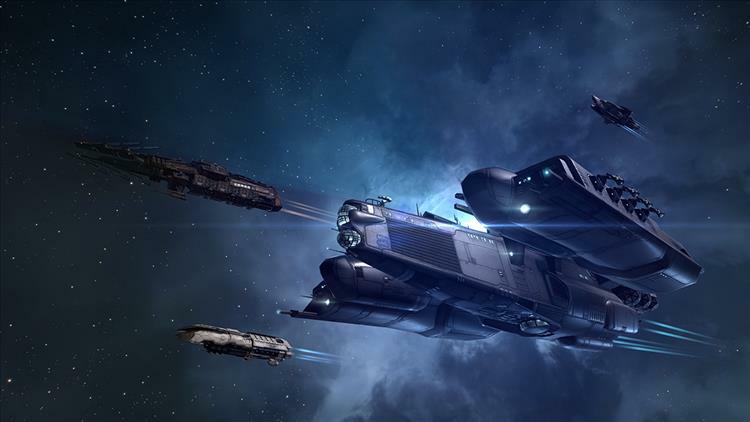 The free-to-play portion of EVE Online throws open the gates in November 2016. This feature will be one of the biggest changes to the EVE universe ever, exponentially and aggressively fueling the boundless potential of EVE's greatest game content—its players. The massively multiplayer universe of EVE Online has been host to some of gaming's most interesting conflicts, meta-game dramas, and player-made content during its rich 13+ year history, earning it awards for game design as well as its community, a place alongside a select few in the first set of video games inducted into The Museum of Modern Art's permanent collection, and the reputation that Killscreen calls "the game that science fiction warned us about." It has inspired documentaries, graphic and fiction novels, developer rap videos, art and source books, charity drives that have raised hundreds of thousands of dollars for disaster relief, real world near-space launches, in-person gatherings the world over, countless player-made songs and propaganda pieces, and even a monument to its players nestled in the harbor of Reykjavik, Iceland. In November, characters will be divided into two clone states. Omega clones will act similar to current active EVE characters, granted unlimited access to skill progression and rapid skill training. Alpha clones will become the new base state for all characters and available to any character at any time, able to train and use a specific set of skills to fly some of the most often-used ships into battle - Tech 1 frigates, destroyers, and cruisers. Access to trading, industry, and exploration skills will allow Alpha pilots to explore the breadth of the universe as well, as they fly alongside hundreds of thousands of other players from around the globe to explore, dominate, and evolve the massive virtual universe unbound by starter zones or server instances. EVE's developers offer the reason for fully opening up access to New Eden in today's blog post. Just like you, we've known this for a long time and, just like you, we've been doing everything we can to bring more people into our spectacular sandbox. Part of our vision for the future of EVE has included more open access for some time, but with the interconnected nature of the game comes vulnerability. We knew that if the flood gates were opened in the wrong way, we could see anything from server meltdowns to the collapse of the EVE economy. Over time, our hardware has improved, code has been untangled (mostly!) and we've found a design we believe in. EVE is ready for this. For more specifics on the initially announced design, visit the developer blog and view the announcement video from EVE's Executive Producer. This November's expansion will also include further development of sandbox gameplay features including the addition of Industrial Arrays, a new class of player-built structures furthering the progress of Citadel structures introduced in April. Other planned features include a new ship, tactical adjustments to warfare links, exciting changes for the Rorqual industrial capital ship, and more to be announced as development of EVE Online continues at its fast pace. The EVE development team has outlined an extensive conversation plan with its players leading up to the introduction of the Clone States feature, catalyzed by the Council of Stellar Management player representatives and their upcoming multiple-day summit at the developer's headquarters. Q&As, focus groups, feedback threads, in-person sessions at the EVE Vegas event in October, and more are planned for the next several months to make sure the final design strikes the right tone of inclusive access without upsetting EVE's beautifully intricate ecosystem. November's expansion follows the massive EVE Online: Citadel expansion earlier this year which introduced staggeringly large player structures to New Eden, a massive new server investment to fuel its thousand+ person spaceship battles, and dozens of regular updates every month that included everything from skill injection to fresh overview UI to new spaceships and modules. It also comes in the aftermath of the 100% player-driven, dramatic, and universe-altering "World War Bee" that has left lots of opportunity in its wake throughout player-controlled null-security space. Changes to the first few hours of the new player experience offer an easier transition into the sophisticated universe as well. There's no better time to come fly amidst the beautiful nebulae of EVE Online.